You are invited: Palm Springs, 1971. Frank Sinatra faces retirement. The air is electric and the crowd jockey for position at Sinatra’s last intimate show. But times are changing as the Rolling Stones and David Bowie dominate the charts. Sinatra’s blue eyes are bloodshot and his face craggy with booze, cigarettes and memories. Things take an unexpected turn when he drinks One for My Baby too many. This is the 2am Sinatra you dream of meeting. Dangerous. Unpredictable. Brilliant. 'Shelton as Sinatra is quite simply phenomenal' ***** (Mike Young, BBC). 'Marvellously played' (Daily Telegraph). "Sheer brilliance, Richard Shelton channelled Frank Sinatra and Richard left the building. As for the songs, close your eyes and take in the sound, of Richard absolutely nailing Sinatra’s voice, as it washes over you. Open your eyes and the likeness is there for all to see." "A model of its kind – not the usual tribute show hagiography but a warts and all portrait of Old Blue Eyes. 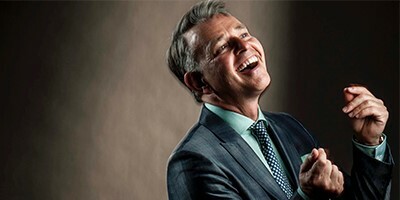 There will be no more sophisticated and polished act in Edinburgh this August Richard Shelton does Sinatra proud"
★★★★★ "As in any great show he leaves you wanting more, more of the music and more of the man"